Did you know that hundreds of companies want to help you celebrate your birthday? To get as much party as you can out of your special day, or if money is a little tight, look for these restaurants and stores that offer free birthday treats. Do you know how to get free stuff for your birthday? Did you know that hundreds of companies want to help you celebrate your birthday? 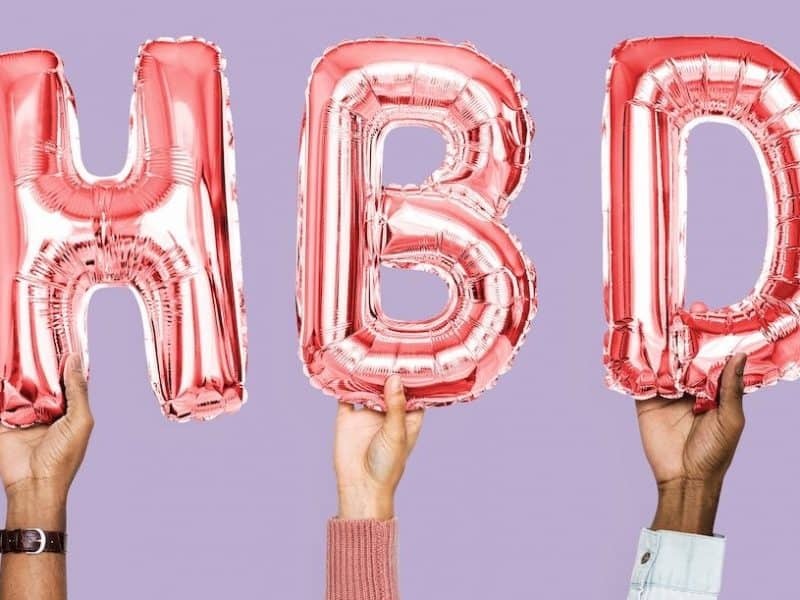 To get as much party as you can out of your special day, or if money is a little tight, look for these restaurants and stores that offer free birthday treats. Some have restrictions on how soon before your birthday you need to sign up in order to get the deal that year. Many give you a gift when you register for their rewards program or newsletter, too, so check out their websites or apps for details. When you join their rewards program you’ll receive a special gift plus something on your birthday. Get a free birthday treat when you sign up for their email list. Get a free sandwich when you sign up for their mailing list and a free birthday treat. Download their app for free drink on your birthday. Get a free travel mug when you join their eClub and a coupon for a free sandwich or salad for your birthday. Earn free pretzels and birthday treats with Pretzel Perks. Get a free taco upon signing up for Club Baja plus special treats on your birthday. The Kids’ Club gives kids a free birthday cupcake from their café. Sign up for the Birthday Club for a free scoop of ice cream on your birthday. Get a free scoop on your birthday when you sign up for their newsletter. Sign up for The Chef’s Table and get a $30 gift card to use during the month of your birthday. Join Dough Nation for free birthday and anniversary gifts. As a member of the Prime Club, you’ll receive a free dessert on your next visit and a free steak dinner your first birthday of membership. Receive a half gallon of their Legendary Iced Tea with your next purchase and a free Bo-Berry Biscuit on your birthday when you join their E-Club. CPK Rewards gives you a free dessert on your birthday. Sign up for MyCSC and get a coupon for a buy one, get one free creation for your birthday. Join the Blizzard Fan Club for a free treat on your birthday. Drink for free if you share a birthday with one of the authors on their list. Just show up with your ID to prove it’s your birthday. Join their Raving Fan EClub for two free tacos upon signup and a free shake on your birthday. Join their rewards program and receive a free Grand Slam breakfast. Get free Dippin’ Dots on your birthday when you sign up for the Dot Crazy Email Club. Get a voucher for a free meal as a member of their Birthday Club. They have the same offer for their Anniversary Club as well. Sign up for their rewards program and get a free drink of any size during the month of your birthday. Sign up for their email club to receive coupons for your birthday. Get a birthday present and other freebies when you join their rewards program. Join the Shmear Society for a free bagel upon signup and a free sandwich for your birthday. Register to receive a coupon for a free medium sub valid during the week of your birthday. Parents may register their children for a free Kid’s Combo meal. Get a free cupcake for signing up and a free cupcake on your birthday. Receive free chocolates throughout the year, including on your birthday, as a Godiva Rewards member. Their rewards program gives you a birthday gift valued at up to $20. Get a birthday gift as a member of their rewards program. Get a free meal on your birthday when you join their VIP List. Get free food on your birthday when you join the HootClub. Join their email list for a free entrée on your birthday. The MyHOP reward program gives you a free stack of pancakes on your birthday. Their Tiki Link program gives you a free dessert on your birthday. Join Jamba Insider Rewards for a free drink on your birthday. Sign up for a free sub and 22-ounce fountain drink coupon for your birthday. The Rewards Club gives you a free doughnut for your birthday. Sign up for their email newsletter to receive a free dessert on your birthday. Members of the Birthday Fellowship receive free admission with the purchase of a full-price adult admission during their birthday month. Join Club Fondue to receive a box of chocolate-covered strawberries and vouchers for birthday treats. Download the Moe’s app for free nachos on your next visit and a free burrito on your birthday. Get a birthday gift when you join their mailing list. Join their rewards program for free birthday dessert. Join My Panera for a free pastry on your birthday. Their rewards club offers a variety of free dishes for your birthday. With the Pinkcard Loyalty program, earn a free frozen yogurt on your birthday. Sign up for a free birthday treat. The Hut Rewards program gives you free cinnamon sticks on your birthday. Sign up for their rewards program for a birthday present. When you join Red Robin Royalty you’ll get a free burger during the month of your birthday. Join Rita’s Birthday Club for free treats on your birthday. Join So Connected for a free burger or Garden Bar Entrée on your birthday. When you sign up for their newsletter you’ll receive a birthday treat. Join The Slice Club at Sbarro for a free pizza slice on your birthday. Get any dessert for free on your birthday. Join Club Veg for a birthday gift. Sign up for the Starbucks Rewards program for a free drink or treat on your birthday. With MyWay rewards get a free six-inch sub and a drink on your birthday. Download their app for a $10 credit on your birthday. Join their email list and receive coupons for free birthday treats. Members of their rewards program get a free birthday dessert. They offer a free entrée on your birthday when you join their email club. Get a birthday treat when you join the Uno Insider’s Club. Members of the Regulars Club get a free birthday waffle. Join The Club and get free fries on your birthday. When you join Zaxby’s mailing list you’ll receive a free Nibbler on your birthday. Get 15% off during the month of your birthday. Join AnthroPerks for a birthday discount. Join Aveda’s Pure Privilege for a birthday gift valued at $23. Members of their mailing list receive a birthday coupon. When you sign up for Fab you’ll get birthday goodies. Benefit Cosmetics offers free brow arch service on your birthday. Call the nearest store for details. Get a birthday treat when you sign up for their newsletter. Join their Love Your Body club to receive a birthday gift and discounts on items. When you signup for a Brooks Brothers credit card you’ll receive a $20 reward on your birthday. Create an account with them and receive a free gift for your birthday. Receive exclusive gifts throughout the year, invitations to beauty workshops, and a birthday present when you create a rewards account. When you sign up with Clarins, you’ll receive free samples with every order and a birthday surprise. With their loyalty program you’ll receive a welcome gift, a birthday gift, and other online shopping benefits. Join the POP club for a 15% off coupon on your next purchase plus a birthday gift. As a member of the extracare BeautyClub you’ll receive a birthday gift, sample products, and coupons throughout the year. VIPeel Premium Members receive a birthday gift. Get a gift card to spend during your birthday month. Receive a free birthday gift when you sign up for the newsletter. Sign up for their newsletter for a free gift on your birthday. Join the E-List for discount coupons, free samples with every order, and a birthday gift. As a member of their Gold Rewards program, get a $10 coupon on your birthday. Join Fresh Family Rewards for free perks such as a welcome gift and a birthday gift. Receive a birthday gift when you sign up for their newsletter. Become a Friend for birthday savings and other benefits. When you join Factory First you’ll receive 20% off and free shipping on your birthday. Join the Birthday Club for special birthday offers. Register for their loyalty program for birthday discounts. Sign up to receive a coupon for your next purchase and a birthday present. As a member of their Elite rewards program you’ll receive a birthday gift and other goodies. Register for an account to receive exclusive offers and a birthday surprise. Sign up for their newsletter to receive a birthday present and other perks. Become a member to receive 15% off your next purchase plus a birthday gift. Sign up for their emails to receive a birthday gift. As a Rewards member you’ll receive a special birthday offer. As an Insider member, you’ll be offered a choice of free goodies at the register on your birthday. Just walk in, no purchase is required for the birthday gift. Their rewards program offers free samples and birthday gifts. With Ultimate Rewards you’ll receive a free gift on your birthday plus earn double points on purchases made during your birthday month. Join Beauty Junkies for a birthday present. Get a birthday gift when you become an Angel. Their rewards program offers a birthday gift and other goodies throughout the year such as free coffee and deals on wine. Become a loyalty member for luxury perks and a birthday gift. Join their Victory club for a free movie ticket on your birthday. Get a free popcorn on your birthday when you’re a member of AMC Stubs. Join Most Valuable Bowlers for a birthday gift. Kids get a birthday present when their parents sign up for More Cheese Rewards. Sign up for their newsletter to receive weekly coupons and perks for your birthday. Get a free car wash on your birthday as a member of their rewards club. Get $10 in free play for your birthday when you sign up for their rewards. With Crown Rewards you’ll receive a $5 coupon for signing up, plus a birthday gift. Pets get a free birthday gift when you join Pals Rewards. Get a free rental on your birthday. As a member of the Regal Crown Club you’ll receive concessions coupons and other goodies throughout the year, plus a birthday gift. Parents can join the Popcorn Club for their kids to get popcorn, movie tickets, and more throughout the year and on their child’s birthday. Previous Post: « ThreadBeast Review: Trend-setting clothing subscription brand.